Paul is seeking and reaching and praying… and he isn’t getting anywhere. The Holy Spirit stops him from preaching in Asia. The Spirit of Jesus won’t let him touch Bithynia. This is different from his first missionary journey. It was wondrous. Paul and Barnabas traveled through Asia, founding churches and setting people on fire for the gospel. But after returning home things cooled off a bit. They come back to a less than rapturous welcome from a Jerusalem church, who wanted to know what they were doing baptizing Gentiles! Then there was a fall out between Paul and Barnabas. The dream team splits. Barnabas heads off with Mark and Paul journeys with Silas instead. Now this trip is not going so well! Bouncing from city to city they can’t plant a toehold in any of them. They were prevented… they weren’t allowed! Whatever form this took, it sounds to me like a lot of angry faces and slammed doors. Faced any rejection lately? Impeccable skills and a flawless resume have not turned up one good job interview? Your past experience in a certain ministry field is now turning out underwhelming results? What gives? What can you do to find where God can use you best? That is what Paul does. He can’t find the place he is suppose to serve… so he keeps moving. He keeps going and going until he reaches the city of Troas. 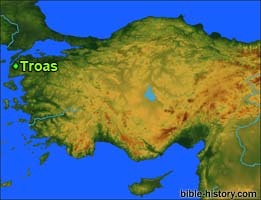 Now Troas was a sea port. That means that Paul and Silas plumb ran out of real estate! In the next few verses God is going to open their eyes to a brand new mission field. But first, imagine the two of them “Sittin’ on the Dock of the Bay.” They are painted into a corner, at the end of the road… Troas! Maybe that’s where you are right now… out of options and very desperate. God may have you there because he wants to open your eyes to a whole new way of viewing your world. And this often comes at the end of where your own ingenuity has taken us. So don’t despair. Keep asking! Keep seeking! Keep knocking! God will grant a vision in His timing! Failing? Running out of ideas? Do what Paul did… keep moving… keep listening. God may be ready to completely blow your mind with what He has in store for you.